Elks Lodges bring so much more to their communities than just a building, They are places where neighbors come together, families share meals, and children grow up. 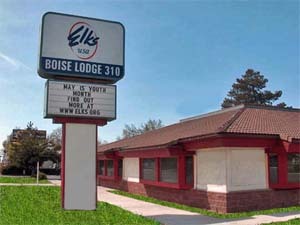 We would like to welcome all Elks to Boise Elks Lodge #310. We are located at 6608 West Fairveiw Ave. The lounge is open at 3:00 pm. Monday thru Friday. Please check our our calendar of events and meetings. The kitchen is fully equipped with oven, stove, microwave, freezer, refrigerator, sink, dinnerware and utensils. The Lodge Room is where our regular meetings are held. They are held the first and third Wednesday of each month, except July and August. It is also where the Lodge Formal and Social functions are held. The Lodge office is open from 11:00 a.m. to 3:00 p.m, Monday thru Friday. The Secretary can be contacted at (208) 377-2763.